Looking for the best blowout ever? Look no further. Shoppers seeking salon-quality hair will not, and we repeat, will not have to leave their homes. This Amazon fan-favorite will achieve great lengths — without going to them! Just as good hair can make a day, bad hair can break it just as fast. It’s a universal fact. Our hair is our crowning glory and needs to be treated as such. Go ahead and blame our skewed perspectives on The Princess Diaries, and its protagonist, Mia Thermopolis. It’s not our fault that we believed good hair products (and an even better, glam-squad) would instantly transform us from rumpled peasants to royal princesses. We could only dream! Sure, we can admit we were left a bit jaded and cynical when we too, didn’t transform with the same flick of a dryer. Instead, it became our mission to heighten our awareness and find out how we too could achieve that Mia (hair) make-over, without the madness. Seemingly so, we found a product that proves the rules of hair care are simple and finite, as Elle Woods said in Legally Blonde. The Revlon One-Step Hair Dryer & Volumizer is the ultimate crown jewel when seeking to achieve all those hair goals. Shoppers can cure even the unruliest of common curls and seamlessly transition to soft, sleek tresses with the touch of a button (or two!). See it: Grab the Revlon One-Step Hair Dryer & Volumizer for $43 (originally $60) on Amazon! Please note, prices are accurate at the date of publication, January 22, 2019, but are subject to change. 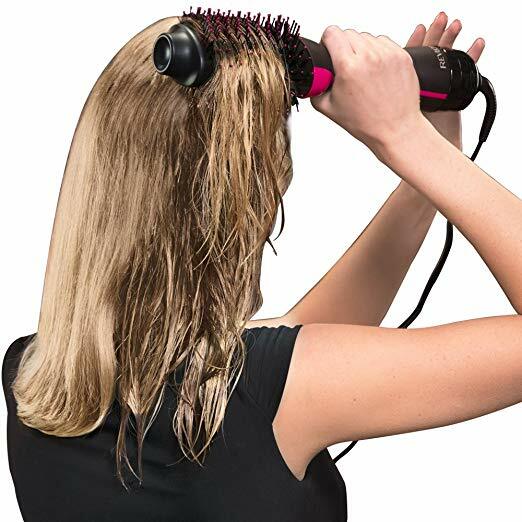 Available on Amazon, the Revlon One-Step Hair Dryer & Volumizer is the solution for the shopper who struggles to use both a round-brush and hair-dryer at the same time. Gone are the days, where the struggle is real. Instead, this product is a one-stop concept. The hair dryer is 13 inches long with a 2-inch shaft and is 4 inches wide from bristle-tip to brittle-tip. It’s big, but not too big. Buyer beware, it’ll take a minute to get used to the hair dryer at first. Unlike a typical hair dryer that stays stagnant throughout the blow-dry, this hair dryer requires more precision. Users will have to train their wrists to be more flexible (think of the added arm work-out!). It’ll be uncomfortable at first but we promise, it’ll adjust. The hair dryer’s unique oval brush is designed to achieve ultra smooth and frizz-free hair. The one-step hair dryer and volumizer will simultaneously smooth hair while its round edges create volume. 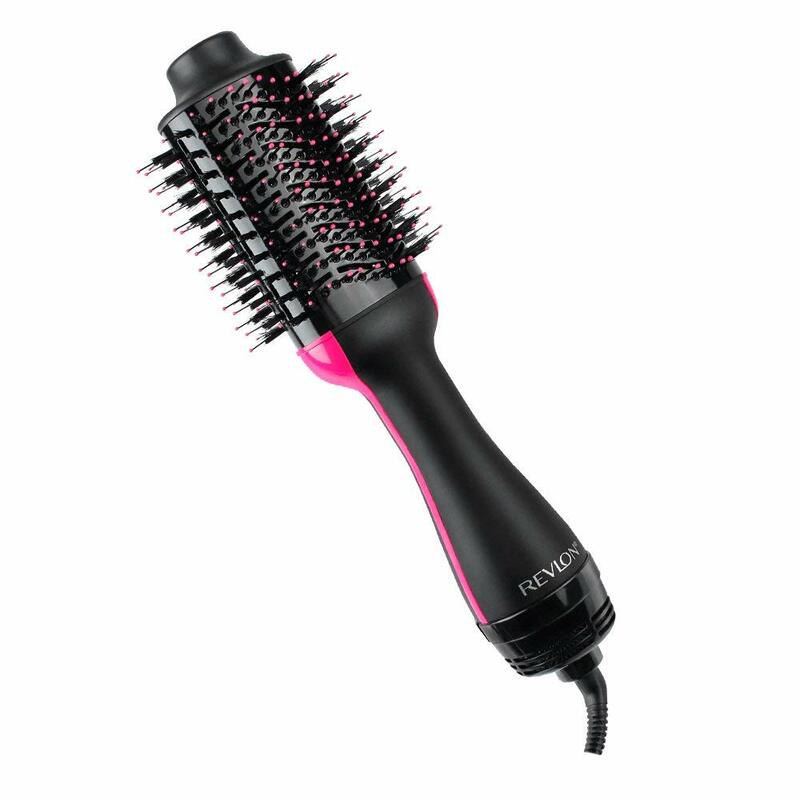 Its nylon pin and tufted bristles detangle, improve volume and controls those unruly flyaways, too. Can we say, va-va-voom! The ionic technology uses negative ions to saturate the airflow during use to help condition, smooth hair while making it shiner. It has also been proven to reduce frizz and static! The best part? Less time equates to less damage. Shoppers can expect their hair to not only be dry but volumized, in one simple step. Meaning? Less damage and equally beautifully results with full body results! And it guarantees to do all of this in half the time of a normal blowout. Dare, we even say more?! For shoppers worried about the safety of their hair while troubleshooting how to and how not to use this brush, we’ve got you! The 1100 Watt power provides just the right about the heat. Unlike most other conventional hair dryers, this volumizer can be placed closer to the scalp for lift. It’s 2 heat/speed settings allows extensive styling flexibility with a cool and warm option. It’s important to note this dryer is exclusively for units/outlets that are 120V-approved. It will not work (and we do not recommend using) on 240v outlets! The bottom-line? Hair enthusiasts will safely be able to achieve that same, larger than life volume, just as the professionals do. How amazing is too amazing? Hoping to achieve that same signature, larger than life volume just like the professionals? We have a few styling tips to help! For faster results, it’s recommended to towel dry hair to remove excess water. Run a comb through damp hair to double-check, then separate hair into manageable sections. Don’t do too much at once, it’s all about focusing on one area at a time! Most important of all? For the sleekiest, smoothest blowout possible: place the volumizer as close (as comfortable!) to the roots and brush down. Think of the tool as a hairbrush and just brush as if it was! It’s safe to say this product isn’t just hype — it’s worth the hype. The hair dryer/volumizer has nearly 3,000 positive reviews on just how powerful (no pun intended!) it truly is. One reviewer with thicker hair was amazed at the flawless finish. A polar opposite reviewer (with extremely fine hair) was left speechless at the volume it added. Clearly, not something the reviewer was used to! Needless to say, regardless to thin or thick hair, this product will do its job! While it’s safe to say, we will never be royals. This hair dryer? It may just be the hidden gem crowning us into all of our hair goals, glory! See it: Grab the Revlon One-Step Hair Dryer & Volumizer for $43 (originally $60) on Amazon! Not your style? Check out other hair products on Amazon! Please note, prices are accurate at the date of publication, January 22, 2019, but are subject to change.